(2018) "I'm a little nervous" I said to my wife as we drove down the main drag of Yountville on our way to dinner at The French Laundry, the place that Anthony Bourdain (RIP, my friend) once said was the best restaurant in the world. Even if that's a slight exaggeration it's very slight, it's three Michelin Stars proof that it's more than hype. I pulled up the unassuming building and into their tiny lot - Wait! I can't take Chef Thomas Keller's spot. I quickly pulled out into the street and I walked a half block dressed in a blue sport jacket that seemed way too fancy for Napa but way too casual for what I was about to do. I had stopped many times at The French Laundry to peer into the windows when it was closed or to take a photo with my selfie grin in front of the sign but have never dined here. But tonight that would change. Come with me as I dine for my first time at The French Laundry. Before we continue let me tell you how to get a reservation at The French Laundry. While it's rumored that hotel concierges can pull strings and American Express holders get special treatment, for most people you have to reserve online at the EXACT moment they open reservations. They open reservations on the 1st day of every odd month (Jan, Mar, May, July, Sep, Nov) at 10:00 am PST. It's a bit confusing but on January 1st they open reservations for March and April. On March 1st they open reservations for May and June. You MUST book via their website, forget about calling them and trying to skirt the system. And you MUST be ready to book at 10:00 and I suggest you be very flexible as to your times and dates as you snooze, you lose. FAQ: WHAT HAPPENS IF I NEED TO CHANGE OR CANCEL RESERVATIONS? Need to cancel? You are out of luck. Think of The French Laundry reservation the same way as a concert ticket. You buy it, it's yours. You can't make it, oh well, thank you very much. Oddly they allow you to transfer it so if you really can't make it you can give it away or sell it to a friend, both only worth exploring if you are in a jam. Bottom line, you need to go into this knowing that there is no backing out or changing your mind once you bought the reservation. FAQ: HOW MUCH DOES IT COST TO DINE AT THE FRENCH LAUNDRY? At the time of this writing in 2018 it costs $325 per person to dine and there are two set menus, the Chef's Tasting (meat and seafood) and the Tasting of Vegetables. It's 9 courses, not including the opening "appetizers", aka Amuse Bouche. Wines by the glass are around $35 for whites and $45 for reds (more or less) and there is no set "wine pairing" option. Bottles are hundreds of dollars, perhaps best for when someone else is paying, and corkage fee $150 per bottle. Figure a glass of champagne to start, a white, a red, be ready to drop $300 per couple on wine as the starting point. While the menu is "set" you can upgrade certain courses which can add another $100 or more to each persons bill. In the end, set aside $1,000 for dinner for two and if it goes over a bit just go with it - it's only money! FAQ: WHAT DOES "SERVICE INCLUDED" MEAN? Service Included means TIP INCLUDED. That's right, you don't need to tip on top of you meal unless you want to as they already added a 20% tip to everything you ordered. If you feel the service was impeccable then no one will complain with adding additional tip. Just don't feel like you must add additional tip as that's the whole idea. "Don't be nervous", my wife said. "It's just a restaurant", she added. 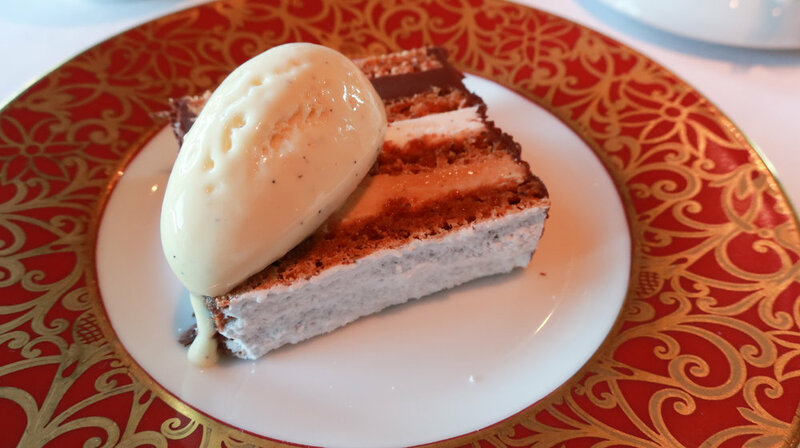 We're eaten in a lot of good restaurants but a meal that starts at $325 per person and easily tops $1,000 for two felt a bit like jumping behind the wheel of a Lamborghini - I mean, it's just a car... or is it? Like a couple of country bumpkins we arrived too early (there's no bar - what do you think this is, Chili's?) 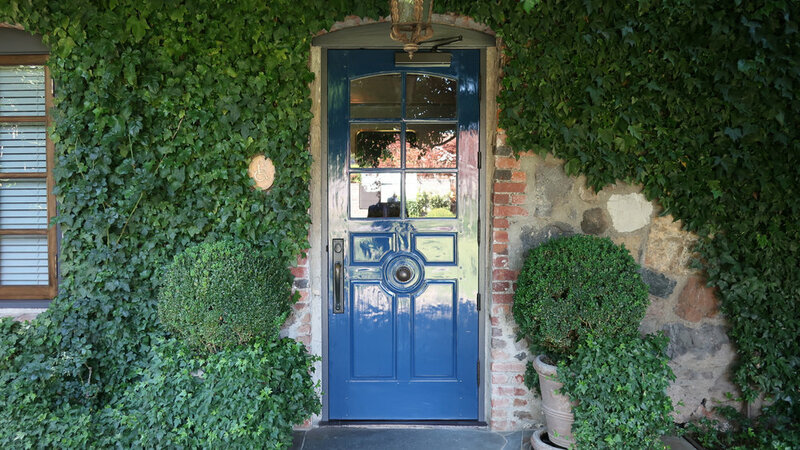 and shuffled around the outside, asking passerby's to take our photo and then the blue door opened like magic and the hostess asked "would you like to come in?" and we were oh so grateful. They seated us instantly and my nerves settled. They were friendly! They were young! They were not stuffed shirts wondering what in the world was a guy like me was doing there. It felt professional, but friendly, and I like that. And then it began. 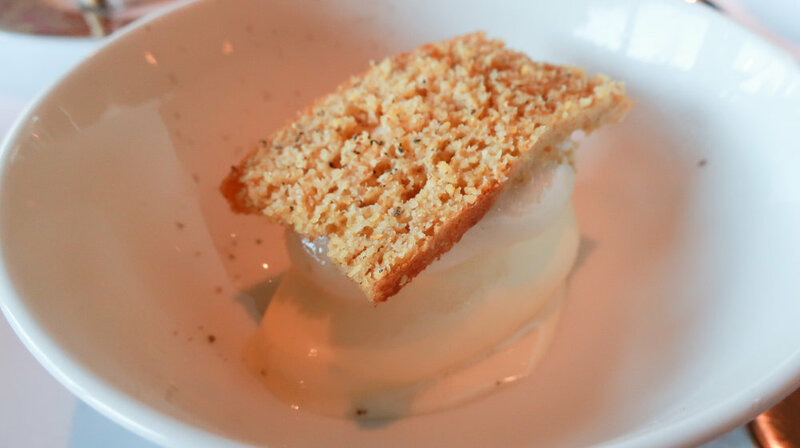 The Amuse Bouche arrived, Keller's play on a 31 flavors ice cream cone but this one topped with salmon tartare and the cone filled with Crème Fraîche - one bite to get all the flavors and it was gone but the delicious memory remains. 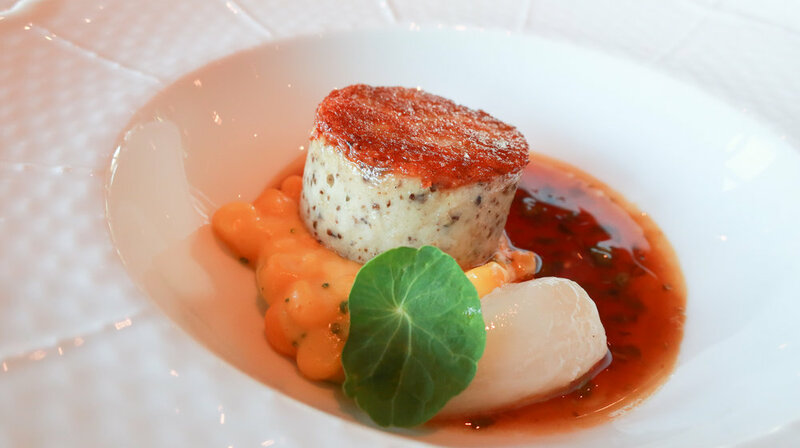 The idea behind The French Laundry is to give you bites of pure deliciousness, to make you want more. This one did just that. The servings are not huge but every plate was more delicious than the last so you didn't care. A Ritz cracker at The French Laundry? And then another amuse, his "Ritz Cracker" that was heaven on Earth. One bite, I can only say that the cheese inside was tangy and tantalizing and if I was falling for the hype let me fall - it was so great. Enough amusing me, let's get onto the meal! This is it! The moment where the images we've all seen in books and on TV become reality. The oysters were butter poached and creamy, the caviar delicately popped in my mouth, they could serve this, close the kitchen and say goodnight and no one would complain. I rate this 10 out of 10. The French Laundry amazes me. For no good reason they brought out an extra course for us to try, the Hen's Egg filled with white truffle custard. Amazing flavors, yes, but even more amazing is the precision used to cut the egg shell. Yes, that's a real egg shell that could not be straighter or more smoothly cut if a laser was used. Maybe it was. Rates 8 out of 10. This tiny salad brought back all the memories of childhood with the freshness and sweetness of the Santa Rosa plum combined with the flavors of fresh vegetables that pop the taste buds like no supermarket produce can. Refreshing, zesty, sweet, smiles on our faces. Another 10 out of 10. The rare trout was like the best sushi you've ever had and the smoked trout dumpling was like eating a guilty pleasure. In all a bit like a bagels and lox sort of thing but once again done with style and finesse and elevated beyond what you think it might be. 9 out of 10. COURSE 5: Alaskan Kin Crab "A La Plancha"
I am still dreaming about this dish, a nice, plump and generous piece of King Crab that was succulent and delicate, the fresh zing of the vegetables, the texture of the polenta, and that sauce, oh that sauce, like a lobster X 10. That's a roma tomato "confit" on top. This one rates 10 out of 10, easy. Of course this isn't just bread and butter. This is a Dried Tomato Baguette with Buffalo Milk Burrata. Delicious, and a nice set up for the next dish. Rating 7 out of 10. With creamed Brentwood corn, glazed garden turnips, La Ratte Potato Puree, and caper-brown butter "consomme"
A quail is a bird so I expected, well, a bird! But instead I was served a dish that looked a lot like a scallop but was in reality a quail sausage made from the quail thighs and topped with a tiny crisp of potato to give it a crunchy yet delicate texture. The "consomme" sauce was to die for, made with caper-brown butter. This one rates 10 out of 10. Veal cheek "Pithivier", Nantes carrots, buttered English peas, and "steak sauce"
I went into this dinner knowing this was a "once in a lifetime" experience but also thinking that the $325 tab was going to be "good enough". When they offered the Wagyu steak upgrade I hesitated. After all, it was an additional $100. I initially declined but then flagged the waiter down around the second course and asked if I could change my mind. And am I glad I did. I have never had Wagyu beef before and certainly very few people outside of the very best steakhouses in Japan have had Wagyu of this quality. It is simply the best, highest quality cut of Wagyu you can get in the US. And it was life changing. That sounds a bit cliche but this absolutely was the very best thing I have ever eaten in my entire life. I want it again but also don't as I fear it will never live up to this night. The texture was tender like a filet but but not like a filet. The flavor was deep and rich with fat like a rib eye but not like a rib eye. It was the real thing, a steak that was the most flavorful steak I had ever eaten. And right there I knew that Anthony Bourdain was right. 10 out of 10. Mt Shasta Cepe mushrooms, Holland white asparagus, Sunflower sprouts, and red wine jus. My wife went with the standard, a tender lamb with a tiny lamb "riblet" and it was also awesome. She gave me the tiny bone which was very nice and very tasty, I gave her a bite of the Wagyu which she loved but thought was enough as it was so rich, and we both agreed that this final course was like a fireworks grand finale. 9 out of 10. Andante dairy "etude" and Australian Black Winter Truffle "fondue"
And then the final course, dessert. And it kept coming. And coming. Mind you, we are two average sized people who just ate the meal of a lifetime. I think we did a pretty good job devouring them. 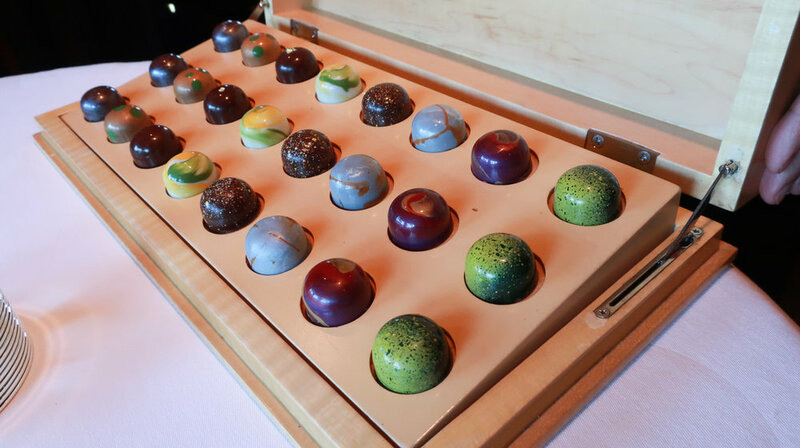 And to torture us they brought out a box of chocolate truffles and asked us to choose one. I went classic with a salted caramel with a gold fleck on top (yes, I am fancy) and my wife did a gorgeous passion fruit and matcha filled one. And then, it was over. Three hours. 10 courses. I was done. I was happy. And just like when your favorite band leaves the stage and then surprises you with one last encore, the waiter asked if I would like to see the kitchen. And there I was, watching the magic happen as the chefs carefully plated dishes and the waiters calmly took their places. 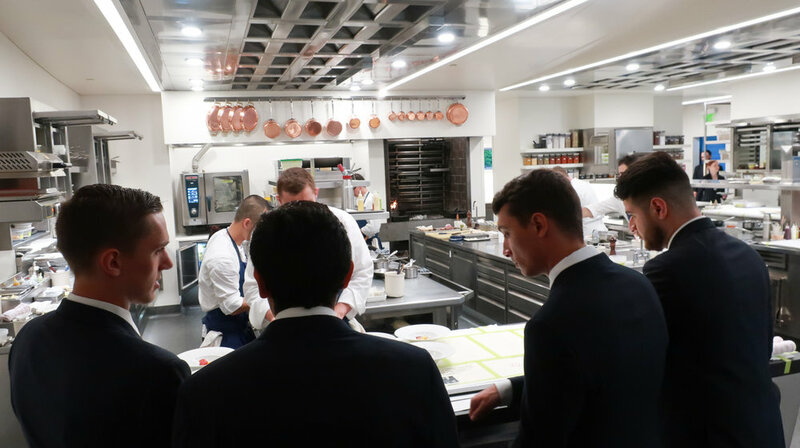 The experience at The French Laundry was once described to me as a fine ballet with every one on the stage doing precisely what they are supposed to be doing and that is how I would describe the kitchen. There was no angry chef yelling "bloody hell! ", there were no pots boiling over, there was only concentration and passion. The chef signed my menu which will soon be framed for my kitchen. After dinner we walked through their gardens across the street and I envied the people waiting outside for their time to arrive. I always thought that The French Laundry was a "once in a lifetime" experience but you only live once so I'm looking forward for another excuse to come in again. 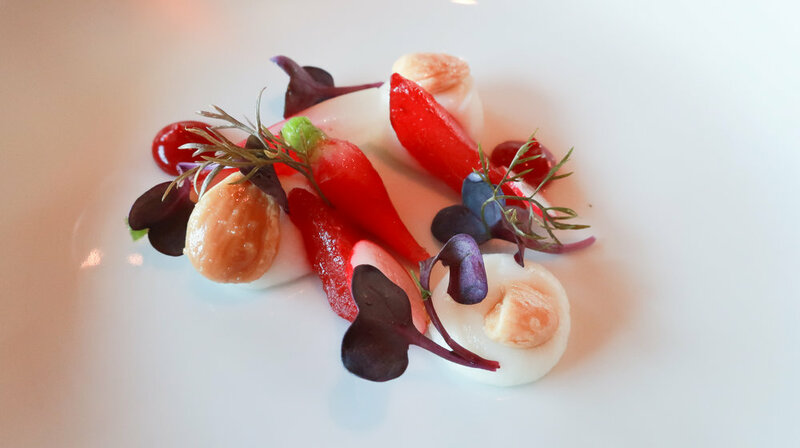 FINAL THOUGHTS: IS THE FRENCH LAUNDRY WORTH IT? I was once told that when you are ready to go to The French Laundry you will know it. That can mean a lot of things but it's probably the best response because you do know when spending a thousand bucks on dinner seems like the right thing to do. In a way it's the same question as if spending $500 on Elton John farewell concert tickets is worth it. If you are a fan, absolutely. If you only want to hear Crocodile Rock, stream it and save the money. I mentioned this to a friend who commented he could get 5 really good dinners for the price of The French Laundry. And he's right. Ruth's Chris Steakhouse is a fine meal and a fancy night out there would set you back around $200. To that I respond that The French Laundry is less of a dinner and more of an experience. I talk to people about this evening with the same enthusiasm as when I came back from Paris for the first time. And if spending a thousand bucks seems extravagant, perhaps saving a hundred bucks a month and waiting a year doesn't. All things considered, you should go. Forget everything I just said and just go. And then you'll see why I can't stop talking about it, I can't stop sharing my photos, my life somehow seems more complete. I didn't expect this to happen. But it did.